“Were you the only ones on that train? What happened to her husband? What happens to her? That is just one untold story and Half-Life 2 is full of untold stories. Stories that need telling. Stories that you should tell. For this fan fiction event, I would like you to write a about any supporting character from Half-Life 2. Your story must be no more than 1500 words. The story can be serious, comedic, scary, light-hearted or whatever genre or combination you desire. Please send your entry, via email, either as a txt attachment or even written in the email itself, to runthinkshootlive@gmail.com, not later than 11:59pm UTC Monday 28th May 2018. All entries MUST be in English (sorry). Authors may enter as many separate stories as they wish. Phillip’s decision is final regarding winners. I’ll be giving away a few Steam games. the more entries I get the more games I will give. I would like to encourage ALL readers to take a look at the previous Fan Fiction Events. There are some great entries in there. 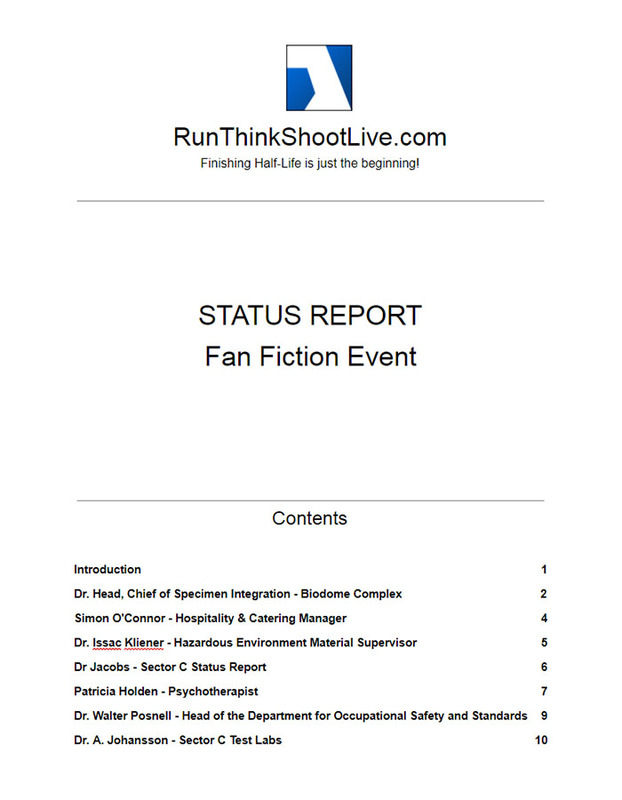 I am pleased to say that this fan fiction event seems to have been a success. 7 reports were received, each with a differing style and tone. The link to the PDf is below, along with a poll for you to vote for your 3 favourite entries. Thanks to all who entered. There will be another fan fiction event in May. Left-clicking the link below will open the PDF report in your modern browser. Right-click, to have the option of saving it to your computer. It’s approximately 184KB.